Personally, for me, there will always be only one FLOTUS, and that is Michelle Obama. There are only two topics in the world that I loathe talking about, and prefer to stay away from, religion and politics. It is very easy to associate Michelle Obama with politics as she has been the First Lady of the US for two terms and did a brilliant job at it, but, when you look at her for the person she is, you'll see the beauty she has in her soul. Michelle LaVaughn Robinson is a graduate of Princeton University and Harvard Law School and has fought all odds to get to where she is today. She recalled facing gender discrimination growing up, saying, that rather than asking her for her opinion on a given subject, people commonly tended to ask what her older brother thought. Michelle also recalls that some of her teachers in high school tried to dissuade her from applying to Princeton, and that she had been warned against "setting her sights too high". She was also subjected to racism by her white roommate's mother who tried to get her daughter reassigned due to Michelle's race. While at Princeton, Michelle became involved with the Third World Center (now known as the Carl A. Fields Center), an academic and cultural group that supported minority students. She ran their day care center, which also offered after school tutoring for older children. She challenged the teaching methodology for French because she felt that it should be more conversational. As part of her requirements for graduation, she wrote a sociology thesis, entitled Princeton-Educated Blacks and the Black Community. By the time Michelle applied for Harvard Law, her confidence had increased and this is also when people began to realize that she could be both brilliant and black. Michelle met Barack Obama when they were among the few African Americans at their law firm. She was assigned to mentor him while he was a summer associate. Their relationship started with a business lunch and then a community organization meeting where he first impressed her. After they married in 1992, Michelle suffered a miscarriage and had to undergo in vitro fertilization to conceive their daughters. She wasn't necessarily thrilled when her husband decided to run for President fearing the impact the scrutiny would have on their daughters. Apparently, she negotiated an agreement in which her husband was to quit smoking in exchange for her support of his decision to run. And boy, how well did that work out! She has stood by her husband like a rock during his campaign or his tenure as President. She has managed to stand out on her own as the First Lady as well. Her speeches were heartfelt and hit the right spot. She visited homeless shelters and soup kitchens. She also sent representatives to schools and advocated public service. She made supporting military families and spouses a personal mission and increasingly bonded with military families. She's been a part of various initiatives and she did not do this because she was the FLOTUS. There was a human connect in everything that she did and that's what mattered and that's what people saw. Her speeches blow my mind, every time I hear them. She used the power she had and the platform she was in to spread good. She connected with people as a woman, as a human and not as the First Lady. Obama himself was humble and grounded and one look at his wife and you'd know where this sense of modesty comes from. In the epilogue to "Becoming", she writes, "I have no intention of running for office, ever," recognizing that "politics can be a means for positive change, but this arena is just not for me." It is such a shame that the great nation would not have a great woman leading them anytime soon. I have to read it now. Soon. I love your theme! Michelle Obama is a lady I admire as well. Too bad she isn't running for president. It is so close to my heart, will read up on the other posts as well. 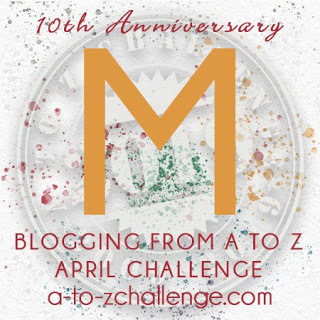 I have been seriously late is posting and reading the posts of other AtoZ bloggers. Hope to make up slowly. I wish she would run, the world would be such a better place then! Truly an inspiring woman who shows us all how colour, gender or race does not matter if you genuinely care for the people around you, if you persevere in making your goals a success and if you truly wish for the best for our society. Oh yes! Such an inspiration! 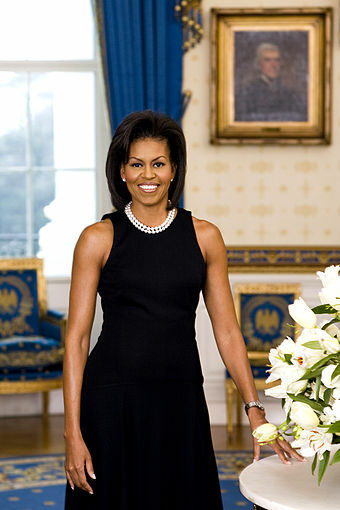 Michelle Obama's life story is inspiring and she is truly a woman of substance. She has made a mark in whatever she has undertaken. Her memoir is on my wish list and hoping to read it soon! I hope to read it soon too! Ah, she is an absolute delight. I go gaga over Becoming for it is the best memoir I've ever read! I can't wait to read it now!